Are you new to the Scentsy products world? Or are you a longstanding Scentsy Bar lover looking for refills? No matter your current obsession with the Scentsy product line, as you’ll soon find out (or may already know), there’s just so much to love about Scentsy, especially the Scentsy Bar wickless candle wax melts. Scentsy Bars are blended waxes designed to be warmed in order to create a fragrant aroma to please the senses. Scentsy products contain zero dangerous chemicals or ingredients and don’t even contain a wick, so there’s no fire or safety concerns to worry about during use. Scentsy Bar wax melt refills are a safe, candle-alternative. Once you purchase a Scensty warmer you don’t have to warm the same scent day in and day out either, like you do with a candle. Instead, you can switch out the scent of the wax melt each day, or even multiple times per day, depending on your mood or the ambiance you’re looking to create. In addition to the many Scentsy scents available, there’s something so unique and special about the quality of the Scentsy wax melts, especially when Scentsy Bars are compared with homemade or other store-bought wickless candles. The scents are long-lasting and can even be re-used multiple times or saved for future re-use. 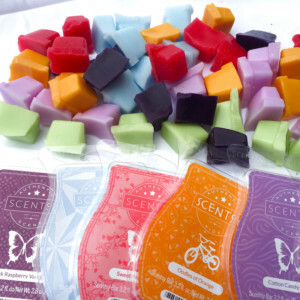 And, when you combine multiple Scentsy Bar wax melts, you can even create custom scents to enjoy. No matter your specific use, Scentsy scents create a pleasant aroma that can help you to further enjoy your surroundings. Another one of the great things about Scentsy Bars is the reasonable cost. Candles today are so expensive! And, with the reasonable pricing, you can afford to try out many different scents before you find your favorites. Unlike candles, when Scentsy Bar wax is melted it does not produce any smoke. In addition, without an active flame you can rest assured that that there is no risk of fire by the warmer accidentally getting tipped over or forgotten about. As long as you are using Scentsy Bars with an intended Scentsy warmer, you can create a safe atmosphere for your family while enjoying many pleasurable scents throughout your home.